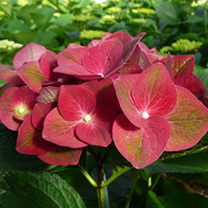 Hydrangea macrophylla 'AB Green Shadow', the dense, smaller, more compact form of this shrub makes it ideal for borders and containers and it has a wonderfully interesting colour changing habit with its flowers initially appearing almost lime green. And as the flowers mature, a deep reddish pink tinge will start to infuse to the edges of the petals until the whole flower has taken on this deep, rich hue. The blooms opening all during late summer and into autumn this colour change will be happening until it stops producing new bud later in the season. Height 100-150cm. Supplied in a 7.5-10 litre pot. Hydrangea macrophylla 'AB Green Shadow', the dense, smaller, more compact form of this shrub makes it ideal for borders and containers and it has a wonderfully interesting colour changing habit with its flowers initially appearing almost lime green. And as the flowers mature, a deep reddish pink tinge will start to infuse to the edges of the petals until the whole flower has taken on this deep, rich hue. The blooms opening all during late summer and into autumn this colour change will be happening until it stops producing new bud later in the season. Height 100-150cm. Supplied in a 3 litre pot or 7.5-10 litre pot.